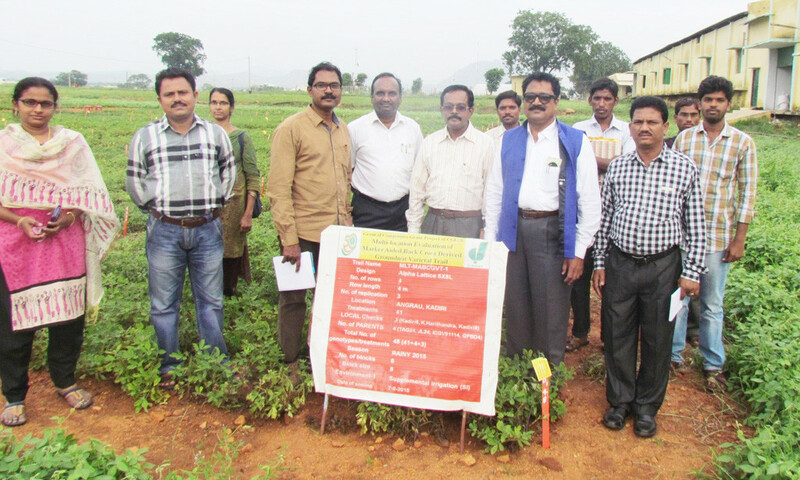 Groundnut lines with improved resistance to rust and late leaf spot disease coupled with high pod yield were identified in six major groundnut growing states in India. These lines were identified after multi-location trials in the states of Andhra Pradesh, Telangana, Gujarat, Karnataka, Maharashtra and Tamil Nadu. The lines gave a higher pod yield compared to recurrent parents and checks under rainfed and irrigated conditions. The introgression lines were developed using marker-assisted backcrossing (MABC) approach to improve foliar fungal disease resistance in three popular groundnut varieties, TAG 24, JL 24 and ICGV 91114. A major quantitative trait locus (QTL) explaining >80% phenotypic variation (PV) for rust resistance was introgressed successfully from the donor parent GPBD-4 to the above mentioned three popular varieties. Later trait mapping studies indicated that the same QTL also controls approximately 60% of PV late leaf spot resistance as well. A total of 57 promising introgression lines containing the above mentioned QTL region have been tested in multiple locations. G 2-52 (4.8 tons per hectare) under irrigated conditions. Under rainfed conditions, introgression lines recorded up to 5.8 tons per hectare pod yield, which is 29% higher than GPBD-4 (4.1 tons per hectare) and 40% over G 2-52 (3.6 tons per hectare) under rainfed conditions. 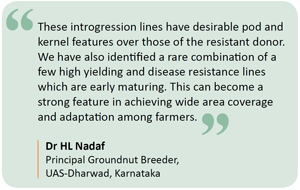 Dr AL Rathnakumar, Principal Investigator, suggested that each center can identify and recommend two or three best performing introgression lines for national testing under the All India Coordinated Research Project on Groundnut (AICRP-G) in 2016. He said that simultaneous inclusion of identified lines for state testing will enable fast-tracking the release process. Based on the results obtained from different centers, it was noted that the identified introgression lines can be categorized into early maturity (95-105 days) and medium maturity (105-115 days) groups. Dr T Radhakrishnan, Director, Indian Council of Agricultural Research-Directorate of Groundnut Research, (ICAR-DGR) congratulated the project team for their efforts. The project review meeting held on 16 December at DGR-Junagadh, Gujarat was attended by Dr T Radhakrishnan, Dr AL Rathnakumar, Dr D Narendra Kumar and Dr PP Thirumalaiswamy from ICAR-DGR; Dr N Premalatha and Dr S Sundaravadana, Tamil Nadu Agricultural University (TNAU); Dr HL Nadaf, University of Agricultural Sciences (UAS-Dharwad); Dr S Patil and Dr MP Deshmukh, Mahatma Phule Krishi Vidyapeet (MPKV), Dr KSS Naik and Dr K Vemana, Acharya NG Ranga Agricultural University (ANGRAU); Dr P Janila and Dr Manish Pandey, ICRISAT. Investor: CRP-Grain Legumes Competitive Grants Scheme. Partners: Indian Council of Agricultural Research-Directorate of Groundnut Research (ICAR-DGR), Tamil Nadu Agricultural University (TNAU), Mahatma Phule Krishi Vidyapeeth (MPKV), University of Agricultural Sciences (UAS-Dharwad), Acharya NG Ranga Agricultural University (ANGRAU) and ICRISAT.